Paddy Jackson wants to make a fresh start in France after having his contract revoked by the IRFU. The Irish outhalf played his first game of rugby in over a year last week when he made his debut for new club Perpignan against Toulouse. Jackson played the opening 40 minutes and it was the first time he’d taken to the pitch since winning his 25th international cap against Japan in June 2017 and he was just happy to be back playing even if it did time him time to get up to game pace. “It’s amazing, it’s hard to describe how good it feels, it almost felt like my first game, which in a way was great but also at the beginning it took me a while to get settled into the game,” said Jackson. 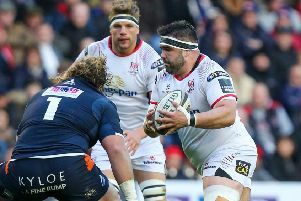 “It had been a long time to just get my touch back but after 10 or 15 minutes I felt really comfortable, the guys around me made it a lot easier, the backs outside me had a great game, it was just a brilliant night. “Once you get on the pitch it’s the same, Patrick Arlettaz, the coach, has been unbelievable.